This holiday season, Marshall is serving up a version of her mother's recipe at her soon-to-open butcher shop, offering customers the satisfaction of their favourite savoury staples - minus the meat. Real Fake Meats, set to open its doors in Halifax's north end this month, is one of a handful of plant-based butcheries across the country swapping beef cuts for beet-stained meat mimicries that vegans and barbecue lovers alike can sink their teeth into. Marshall spends hours in her kitchen tinkering with vegan variations on traditional fare that evoke the taste, texture, sight and smell of their carnivorous counterparts - that alchemy of sensations that reminds her of her mother's ham, but with a plant-based twist. “What we're trying to do is show that veganism doesn't just have to be about rabbit food,” Scott said. “You can still have all these familiar foods you enjoy, and you don't really have to sacrifice anything. It's also a way to distinguish the quality of their products from the highly processed “plastic veggie sausages” that populate grocery aisles as industry players catch on to the rise of meatless eating, Scott said. Since their start in farmers' markets, Scott said the tight-knit operation has struggled to keep up with demand for their plant-based delicacies. For the grand opening of their first retail location in early 2017, he said more than a thousand people lined up to check out their meatless offerings, which sold out so fast they had to shut down the store for a week to restock. It's a challenge he said has dogged Very Good Butchers as they scaled up to a bigger space to expand their hot-food offerings, and through the launch of a faux-meat subscription service that ships across North America. Today, Scott said he has a hundred grocery stores on a waiting list to carry their products. He attributes much of this success to the growing numbers who are factoring in health, environmental and ethical concerns around meat in their diets, estimating that about 40 per cent of the vegan butchery's clientele are omnivores. 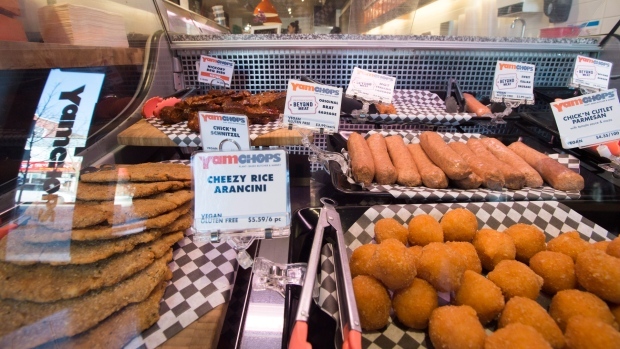 Julie Boyer and John Tashjian, co-owners of Yamchops in Toronto, said Canada's first plant-based butchery has seen attitudes change in the four years since its founding, and perhaps in some ways, contributed to this shift. It's not realistic to expect that all eaters would choose a hunk of tofu over a rib eye steak, said Tashjian, but when offered satisfying options, many people will incorporate meat alternatives into their diet.